Whether you believe in climate change or not, no one can deny unusual weather has happened more frequently in the last few years. This has an effect on food prices and the quality available to purchase at our local grocery stores. 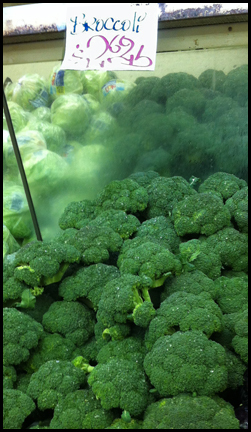 In late January, broccoli shot up to $2.69 per pound at my local veggie stand. 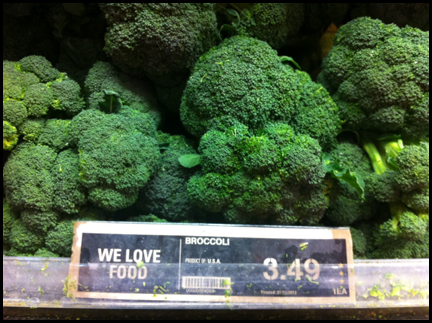 It was even more expensive back east, where my sis sent this snap shot of broccoli at her local grocery store in Toronto. YIKES! Thankfully, the cost of broccoli has come back down. It was $1.29 per pound at my local market yesterday. What cause the spike in the price of the green florets of the brassica family? 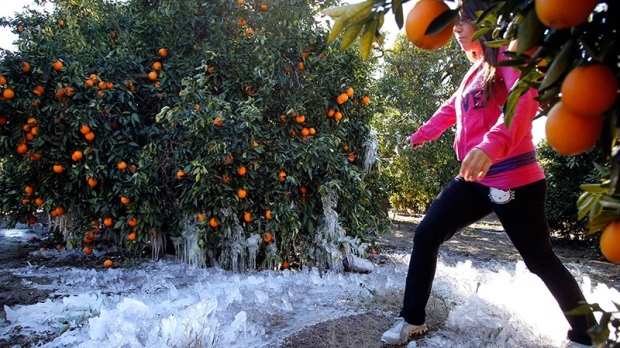 A very unusual cold snap happened in California and Arizona causing multiple crops like citrus fruits, lettuce and broccoli to freeze. Normally temperatures in Southern California for January range from 4C to 22C and you can clearly see in the photo below the temperatures dropped well past 4 C (Photo Credit: AP – Jae C. Hong). As I researched why my produce cost so much, I came across many articles warning about the increase cost of meat and dairy products this year due to the drought which occurred in the USA this past summer (like this article – http://www.foodnavigator-usa.com/Market/How-much-will-this-summer-s-drought-impact-food-prices-in-2013). Whether it is extreme weather like super storm Sandy or just unusual temperatures changes like the cold snap in California, these disturbances impact the way we eat. This recent price increase has really brought into focus what changes I may need to make if food costs continue to rise. In terms of eating out, I realized that for a little while it may be cheaper to do so than cooking at home. However that won’t last long as eateries will eventually have to pass on the increased food cost to their customers. Many won’t be happy to do it, as most businesses worry increasing prices will drive away their consumers. I would think menu changes would occur as well as restaurant use different ingredients to try to maintain their competitiveness. It may be a tough year for the eateries to manage their costs. In terms of cooking at home, I think I will have to expand my repertoire of recipes just to be versatile and include more vegetarian meals. I prefer certain veggies but I can’t afford to pay $2.69 per pound for lettuce or broccoli. Carrots and cabbage always seem cheaper than leafy greens. It may also allow me to explore my Chinese heritage more, since it is one that doesn’t waste anything. I have always been exposed to things like offal and actually really like chicken gizzards and kidneys. I would prefer to stick to steaks chops and fillets but it if push came to shove, stirred cabbage with chicken gizzards and more tofu dishes here I come. Have you made changes to your eating habits due to increased food prices? Anyone have a cabbage recipe that’s not cabbage rolls or slaw they want to share with me? Let me know.